Wamena, Jubi – A witness in Areke Wanimbo’s case, Theo Hesegem, refused to testify in the trial against Areki Wanimbo in the Wamena District Court on Wednesday (18/02/2015). He said the prosecutors should present two foreign journalists because they are the reason behind the arrest of Areki Wanimbo. When both journalists were tried in Jayapura, Wanimbo appeared as a witness. “The Prosecutors must present both of them in this trial because Wanimbo testified in their trial as a witness,” Theo Hesegem said in his statement in front of judges in the Wamena District Court on Wednesday (18/2/2015). He also refused to testify because he believed there is an inconsistency consisted in the sentences between the prosecutor’s charge and the police’s charge. “In his indictment, the prosecutor said the witness Theo introduced Domi Surabut to the suspect Areki Wanimbo, while the police said I didn’t know Domi. Based on this difference, I refuse to testify in this trial,” Hesegem said. Based on this rejection, the prosecutor assumed to recall him as witness next week. Meanwhile other witness Pither Wanimbo testified in the trial that the suspect had no connection with the letter of circulation on donations issued by the Papua Customary Council. “I am the Lanny Jaya Customary Chief, not Areki Wanimbo. But because of the short of time to distribute the letter, I asked him to sign it because he is the tribal chief. But he didn’t know what was it about,” Piter Wanimbo testified in the Wamena District Court. After Piter Wanimbo’s witness, the Presiding Judge Benyamin Nuboba suspended the trial and it will resume next week on Wednesday, 25 February 2015. Meanwhile, Areki Wanimbo’s laywer Simon Patirajawane told reporter after the trial that Hesegem’s objection is part of his right as witness. “At the time of examination, a witness (Theo Hesegem) objected to testify in the trial because he wanted two foreign journalists to become witnesses in this trial. Because they caused him to go behind bars,” Patirajawane said. Related to witness Piter Wanimbo, he thought many things were not suitable with the Police’s charge. “As a lawyer, I thought there are many things improper with the Police’s charge. For example there is a point in the charge that he (police prosecutor) pulled out. It actually benefits us because the suspect was accused in relation to the letter on donation, but the fact is the suspect didn’t know about it,” he said. Areki Wanimbo was a resource person of two French journalists Thomas Charles Dandois and Valentine Bourat who arrested by the Jayawijaya Police on 6 August 2014 in Wamena. When foreign journalists are banned from an Occupied Land, who better to tell the story than the people who live it. Your donations support and help deliver training for a free and independent media in Papua, safe from harm from those who want to prevent the story getting out. We are entirely non-profit and rely on your support to continue our work. Please donate generously. WestPapuaMedia still needs your help for behind the scenes hard work despite publishing break. Also looking for extra folks to help with editorial. ​Breaking: ULMWP membership of Melanesian Spearhead Group decision deferred until September in Vanuatu. AwasMIFEE: New companies threatening the Papuan forest: Number 1 Pacific Inter-link. WestPapuaMedia is about to clear a backlog of articles – please be patient. All original content by West Papua Media is licensed for approved, non-commercial use under a Creative Commons Attribution-NonCommercial-NoDerivs 3.0 Unported License. The West Papua Media logo, name, Westpapuamedia.info, West Papua Media Alerts, Safe Witness Journalism, eyeSAFEMoJo, isafemojo, and Safe Witness Broadcasting, FiveARM (Field Investigation Vertically Exhaustive Assessment and Reporting Methodology for Human Security Incidents), JournoTriage, and Journalism Triage Protocol are all original creations of West Papua Media, and we assert all rights to the use of these names exclusively. Any third parties attempting to use our name or derivatives of our identity without permission are in breach of Copyright and will be subjected to DMCA orders. Any reprints or syndication for non-commercial use must be attributed to Westpapuamedia.info and the original content author. This extends to original text, audio, video or photos appearing on westpapuamedia.info. Any commercial or for-profit use is subject to negotiation and/or payment/donation and is subject to copyright to West Papua Media and/or original content creators. 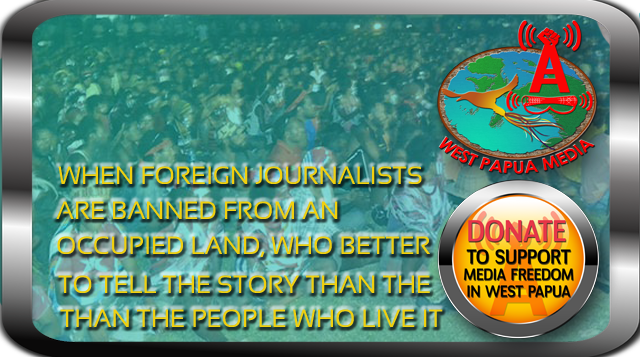 Please contact editor @ westpapuamedia.info for syndication or content use requests. West Papua Media also utilises content from other outlets and partners under Creative Commons principles for non-profit use. West Papua Media retains the right to reprint, embed or syndicate without charge any article or content by other organisations that has been written or produced with the assistance of any of our staff, fixers, stringers or editorial team. However, we respect the assertion of rights to intellectual property and will honour any reasonable request. We are non-commercial so we cannot pay you, but we can greatly enhance the spread of your content. We will endeavour to remove any content that is so requested by copyright holders, and if commercial use is sought from us, we will fully disclose to copyright holders the request, seek further permissions, and if payment is given to West Papua Media, we will pass on proceeds to copyright holders in accordance with their wishes and rights. West Papua Media's principal mission is to assist in the development and advocacy of a free and open media capacity for West Papua, and to provide a Public Interest journalism service on issues affecting West Papua, for the international community. Contributions subject to editorial policy always welcomed. Donations are welcome and required to enable this mission to succeed.